While we still have letters, manuscripts and other physical documents from the past centuries, we are in danger of losing digital documents created in the last decade. Literary scholars rely on the traces left by writers – from correspondence to drafts – which now take the form of born-digital records. Publishing historians also need access to the records left by publishing companies. Emails and other digital forms of communication have largely replaced letters and memos, and yet, safeguarding digital archives remains an enduring challenge for archivists. Electronic records risk becoming unreadable due to rapidly changing formats and technologies. Even when digital archives are actively preserved, they are often closed to researchers due to data protection and other issues. To paraphrase Tolkien, the scripts and tongues of our digital age risk becoming dark to later men. As late as 2010, a report from the American library community OCLC declared: “Management of born-digital archival materials is still in its infancy.” What progress has been made to preserve digital archives? How can we improve access to born-digital collections? How can archivists and scholars collaborate to create a better future for digital collections? 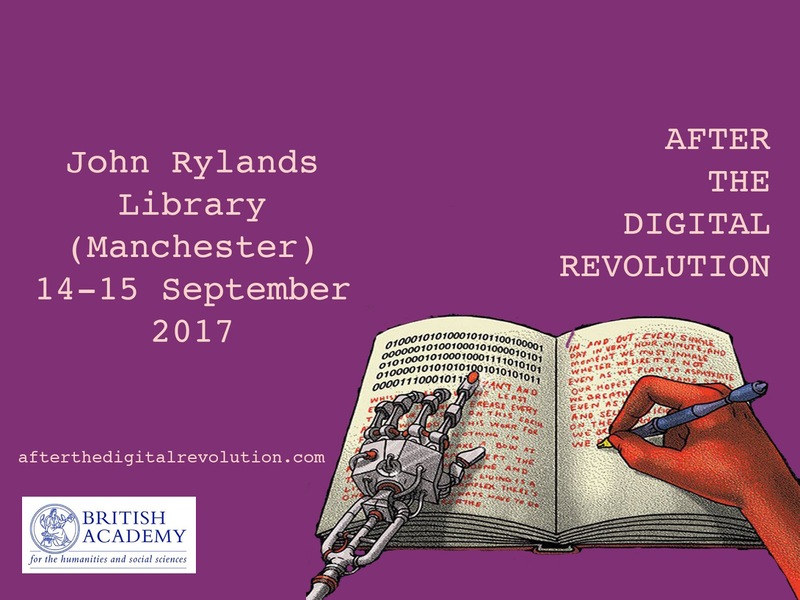 This workshop at the John Rylands Library (Manchester, 14-15 September 2017) is the first of two “After the Digital Revolution” events funded by a British Academy Rising Star Engagement Award awarded to Dr Lise Jaillant. It will bring together 30 participants, including 15 early-career researchers to discuss and find solutions to the issue of preservation and access to born-digital archives. Contributions are invited from archivists, literary scholars, historians, policy makers and anyone with an interest in digital archives. Each participant will be asked to prepare a 10-minute contribution addressing the specific theme of each workshop. Contributions can take the form of a short paper on current project(s) or a lightning talk to share a specific tool/ method in relation to the workshop theme. In addition, early-career researchers (within ten years of their PhD) will be asked to prepare a poster summarising their contribution to the workshop. If you would like to participate, please send a CV and 300-word description of your planned contribution to: l.jaillant [at] lboro.ac.uk by 17 July 2017.